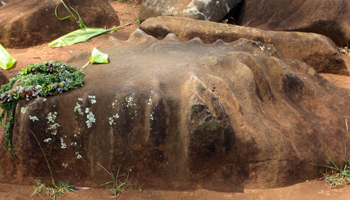 Kukaniloko: The Place Where Kings Were Born. Kukaniloko: The Birthing Place of Kings! The Kukaniloko Birthing Stones (coo-kah-nee-lo-ko) State Monument is among the most important Hawaii historic sites on the island of Oahu. 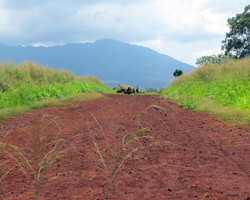 That said… I’m not going to tell you that you have to drop everything you’re planning for your Hawaii vacation so that you can drive out to the middle of a field and look at a bunch of rocks. Kukaniloko is the place where Hawaiian ali’i (chiefs and kings) were born. It is one of only two such sites in the state; and it was a center of mana (spiritual life force) and Hawaii culture for hundreds of years. Climbing on the rocks is NOT appropriate. They must not be moved, removed, or vandalized. For these reasons, this location is considered to be a very sacred site. Visitors come to experience the spiritual energy of the place; and they often leave special offerings of lei and ti leaves. If you look carefully, you may also notice ancient Hawaiian petroglyphs (rock art) on one of the stones. Click for a detailed explanation of the birthing ritual at Kukaniloko (link opens a new window/tab). Basically, I would suggest this: if you’re already going to be out scenic Hawaii sightseeing in the direction of North Shore Oahu, you will likely pass through an area called Wahiawa, which is located in the middle of the island. If so, you’ll be close enough to swing by for a quick view, which will probably be well worth your while. 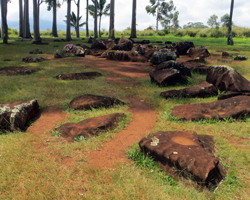 The Kukaniloko Birthing Stones are located in what used to be central Oahu’s endless pineapple fields – just a few minutes away from the Dole Pineapple Plantation and the Tropic Lightning Museum on Schofield Barracks. 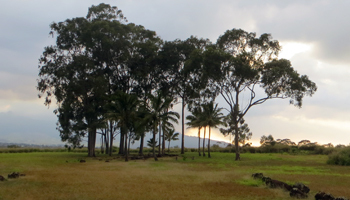 To find this historic Hawaii attraction, get yourself to the section of Kamehameha Highway just north of Wahiawa town. The first traffic light past the steel bridge is Whitmore Avenue. At that intersection turn left down into the stump of a closed farming road. Park your car. Then get out and walk past the gate along the dirt road (approximately 125 meters) out to the cluster of rocks shaded by a small grove of trees. 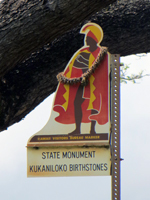 If you’re in doubt about whether you’re at the right place (which would be completely understandable), just look for the Hawaii Visitors Bureau Kukaniloko Birthing Stones monument marker. When you see that, you’re good to go. I should caution you, however, that it rains frequently in Wahiawa (which is why it’s good for agriculture). As a result, the roadside parking area can get flooded, and the dirt road can get very muddy. If it has been raining, you should probably wait for conditions to dry, or come prepared for a bit of a mess. The red dirt in this area gets it distinct color from oxidized iron (rust) in the soil; and it never washes completely clean from your clothing. That’s why it’s best to avoid getting it on your clothes in the first place. If you choose to ignore my warning, be aware that there are no facilities of any kind at this Hawaii attraction. No restrooms. No water fountains. No hoses. I don’t even remember any trash cans. Whatever you bring in with you needs to go back out with you. This is a sacred site that doesn’t need to be defiled with litter.